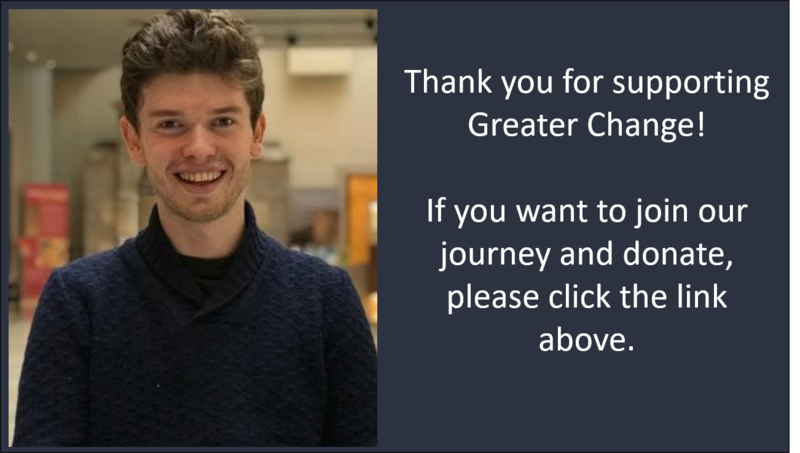 Thank you for your support of Greater CHange! Think about the last time you saw a homeless person. Did you have any change to give?Would you give if you knew their story? 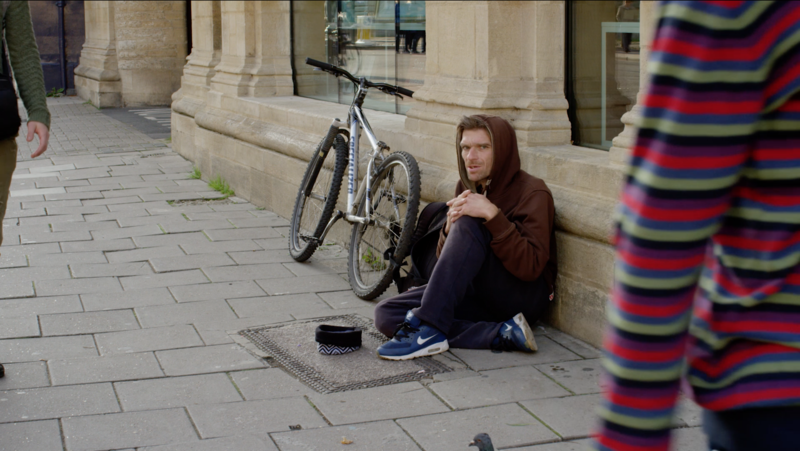 Would you give if you knew the money would help them get out of homelessness? Greater Change is a mobile phone app that will enable the general public to make secure, cashless donations to support the homeless. The app will tell the stories of the individuals it is being used to support, helping the public understand their situation and needs. It will show what they are saving for and how a donation will contribute to getting them out of the cycle of homelessness. Help us raise £48,400 to build, test and bring the homeless Greater Change. When somebody who is homeless joins Greater Change, we will connect them to a support worker. Together, they will identify the individual's needs and create a plan to bring about lasting change in order to leave homelessness behind. Examples of what might be needed include: a skills course or work clothes, covering the cost of identification documents or saving for a private rent deposit. Donations tagged to an individual will be held by our partner charity until the individual has raised enough for their agreed purchase. Support workers will guide the spending plans and release of funds, ensuring that donations are suitably directed to meet individuals’ needs. In this way, Greater Change ensures that money given through the app will be spent on helping the individual leave homelessness behind for good. So you can give without carrying change, but know you’re making one. We will be working with support and guidance from Aspire Oxford, an award-winning charity and social enterprise focused on enabling homeless people and other disadvantaged groups to find long-term employment. We also want the app to facilitate giving to a range of other local organisations and charities that support the homeless. When you make a donation through the app, you can opt to be kept informed of the progress the person you’ve supported makes in changing their life and getting off the street. This will let you see how your gift has made a difference. We think that by telling the stories of the individuals supported through the app, Greater Change will help create empathy and understanding as those individuals work to transform their lives for the better. Together we can work to break down the social stigma surrounding homelessness. An estimated 80% of people who beg do so to support an addiction - We want to ensure that donating means empowerment. By giving through the Greater Change app you will be helping individuals find long-term solutions that are right for them. 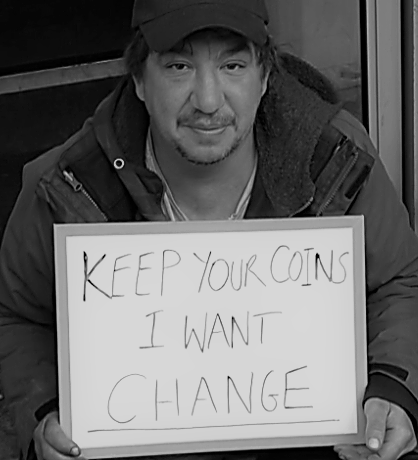 People no longer carry change - Greater Change will allow you to donate when you've got no cash. Giving change is inefficient - We can add Gift Aid to your donation, increasing the amount you give by 25%. Saving is almost impossible when you are homeless - Greater Change provides a mechanism for people sleeping rough to be able to save for training, a rental deposit or other items vital to transforming their situation. What will this crowdfund achieve? The aim now is to raise the money we need to cover the development and testing of the mobile phone donation app. 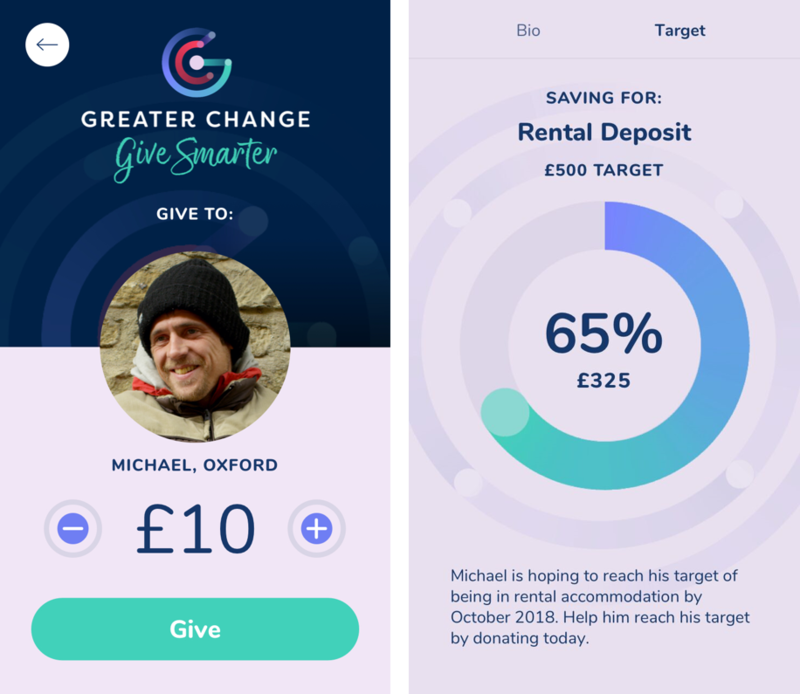 £22,000 : This will pay for a basic version of the Greater Change app to be built and trialled for two months in Oxford. - Target reached! Thank you! £27,400 : We will be able to evaluate the trial, make changes and implement a longer, more comprehensive five month Oxford pilot. - Target reached! Thank you! £32,400 : We will be able to build scalability into the technology, making it easier for us to support greater numbers of homeless individuals from a wider geographical area. We will also be able to enhance the functionality and styling of the app. - Almost there! £37,500 : We will be able to run a second pilot in another UK city to demonstrate reproducibility. £48,400 : We will be able to fully integrate any necessary improvements from our second pilot, ensuring we have a fully functional digital platform able to withstand usage across multiple UK cities. Over £55,000 : This will cover additional elements of design, development and planning needed to serve a larger number of cities spread more broadly across the UK. We plan to build the app using the expertise of Global Initiative, an Oxford-based company that is passionate about web design and software development. Global Initiative has generously offered to cover 50% of our development costs through its Initiative Fund , which it launched last year to support projects with a beneficial social impact. The company has been an incredible advocate of Greater Change and its support means that the targets above are roughly half what they would be otherwise. For this, Global Initiative, we thank you! Greater Change is a project by Alex McCallion, who studied Economics and Management at the University of Oxford and is currently a Research Assistant at the Saïd Business School. Alex was actively engaged in homelessness outreach while he was a student. He became interested in the effectiveness of giving change. Through discussions with local charities, it became clear that giving change to homeless people on the streets often does little to help. 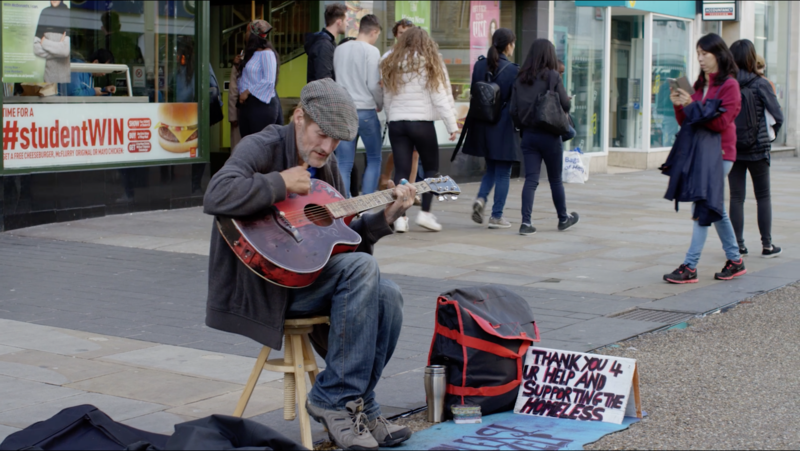 Despite this, surveys estimate that hundreds of thousands of pounds are given directly to individuals on Oxford’s streets each year. Alex wanted to find a way to harness this goodwill more productively and effectively. He also saw that as we move towards a cashless economy, we need new mechanisms for charitable giving to the homeless. Through countless discussions with charities and support workers, and with the homeless individuals the project will benefit most, the idea for Greater Change was born. Carol Concert in Oxford and Art Exhibition at Modern Art Oxford - Watch this space! Follow this page using the button at the top for updates. If you have any questions about the project, you can reach us at greaterchangeuk@gmail.com, and if you'd like to chat about other ways you can help the project, we'd like to chat about that too! Your donations are greatly appreciated, but you don't have to donate to help us succeed! Please share this project with anyone you think would support us - on Twitter, Facebook, LinkedIn, by email, telephone, and of course don't forget to tell your friends about it in person too! With special thanks to Crossform Media for their generous support. We will list you on our Wall of Supporters on the App! Dinner at an Oxford college, where you will have a chance to meet and talk to the Founder of the project, Alex McCallion.